A little while ago I wrote blog post about useful report that can be leveraged while implementing several SAP Notes. 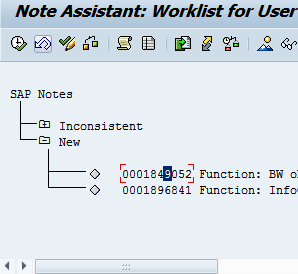 With help of the report it is possible to load multiple SAP Notes corrections into the system where the t-code SNOTE can pick them up from. I had few inquiries from readers of my previous blog. They were interesting on topic how to actually download SAP Notes corrections from SAP Service Marketplace (SMP) before they can use the report mentioned. I’m going to elaborate it in more details in this blog post. Usually it all starts at SMP. Once the SAP Note that has a correction that needs to be implemented is found it needs to be downloaded. Usually the Notes with correction have a Download button on the Note’s screen at the SMP – in Notes application: service.sap.com/notes. Once someone clicks on the button a new pop-up windows is opened. It informs about adding the object into basket of SAP Download Manager application. Normally the object can be downloaded via the Download Manager. However in case there are just few objects that are being download the download can be simply done over HTTP protocol. So someone has just click on “Download Basket” button and content of the basket is displayed. From here just a simple click is needed on the particular object and browser displays dialog to save the file locally on user’s machine. Once all objects from SAP Notes are downloaded to local machine like one above then they need to be uncompressed (usually they are in form of ZIP files). Now the report mentioned in my previous post takes place. Simple run the ZSCWN_NOTES_UPLOAD report in e.g. t-code SE38. On its selection screen enter path where the files with the Notes corrections were stored. After report ran there is a message “Files loaded” appearing in status bar of SAP GUI. 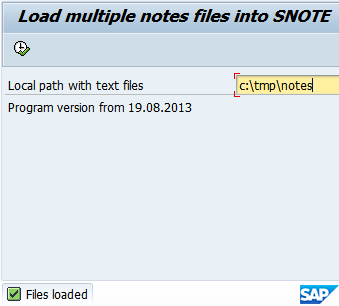 Finally t-code SNOTE is used to implement the corrections of the SAP Notes. SAP BW in its versions starting with 7.0 introduced many changes to BEx queries. This resulted in a situation that there are two types of queries. First there are “old” or 3.x based queries. These were created with BEx Query Designer 3.x tool. On other hand we have “new” or 7.x based queries created in BEx Query Designer 7.x tool. As a side note sometimes in SAP documentation they refer to 3.x BEx as “Business Explorer 3.5” or “BI BEx Suite 3” or “NW 2004” and to 7.x as “NW 2004s” or “BI BEx Suite 7” or “BEx 7”. SAP advised to perform 3.x based queries migration to 7.x fashion right after the 7.x version popped up. However customers were neglecting it. The fact is that even in SAP BW 7.3 the 3.x based queries still run without problems. In version SAP BW 7.4 the BEx tools (Query Designer and Analyzer) of version 3.x are not available but Analytic Engine of BW 7.4 can still execute these queries. Even we still can run the 3.x queries in BW 7.4 it is highly advisable to migrate it finally at this point of time. The BEx queries have gotten many new features in BEx 7.x. Also new BEx Query Designer of 7.x was redesigned so therefore it makes no sense to keep the query in old fashion. Now how to recognize what queries are in the SAP BW system which the 3.x based? Version of the BEx tool that was used to edit particular BEx Query elements is captured in table RSZCOMPDIR. The table has column called VERSION which hold information about version of the reporting component. And exactly this is the field that tells us either it is query of 3.x or 7.x. As per value of the column; if it is higher than 100 it means that 7.x query if it is less than 100 means it is 3.x. This component was edited with a more recent version of the Editor. You also have to use the more recent version to edit further. Further processing not possible. Update your front end'. There is one more thing. 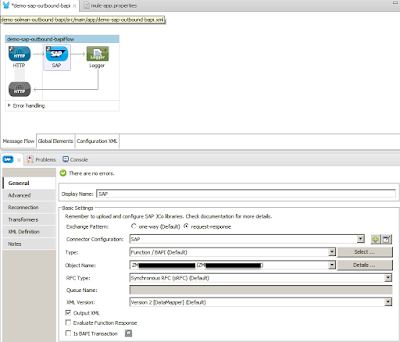 If you open the old query in new BEx Query Designer the system performs automatic backup of the query. It stores the backup of the query and its component which was originally created in 3.x version of BW. The backup components can be recognized by value “B” of column OBJVER of table RSZCOMPDIR. 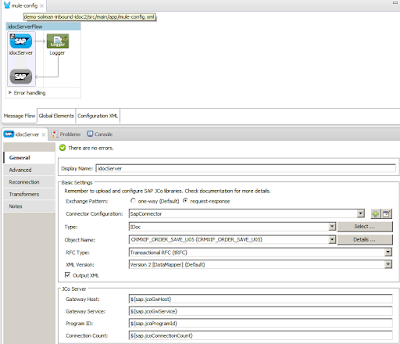 Unless the query is saved in the BEx Query Designer 7.x it still can be opened in old BEx QD even it has backup version. There is an ABAP report (COMPONENT_RESTORE) provided which can be used to convert migrated query to 7.x back to 3.x version. Needless to say this is not foreseen to be used too much; of course. Also notice that once restore is done then all modifications done with QD 7.x are lost. Similarly as in my previous post I’m sharing a little about my experience while working with MuleSoft Mule ESB platform. In next text I depict simple flow in the mule which listens for incoming data coming into the mule’s app from an IDoc generated in SAP. 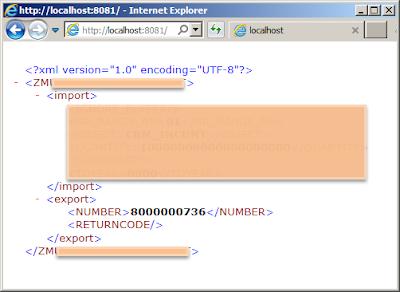 Once the IDoc of certain type is created in the SAP it is displayed in the app’s console. 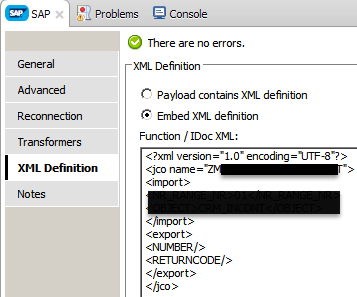 Needless to say that the IDoc gets generated in the SAP when some business data gets modified (created/changed/deleted). There is quite extensive configuration to be done at SAP side with regards to ALE customizing in order to setup the IDoc generation. 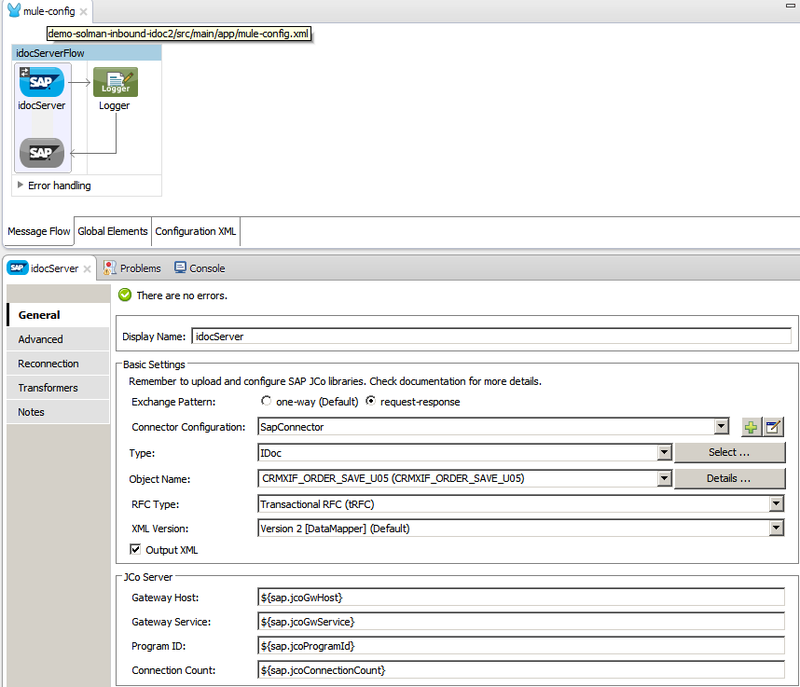 On the mule side there is just an SAP Connector configured which acts as the IDoc listener. The IDoc Basic Type needs to be specified in its Object Name field. 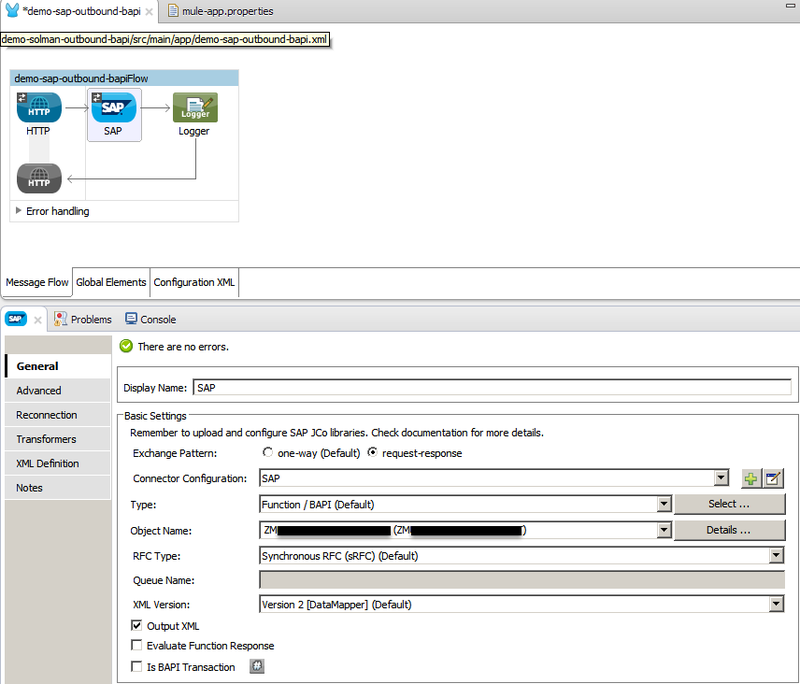 All parameters for connection form the mule app to the SAP are taken via parameters form mule-app.properties file. Recently I wrote blog post about topic of syntax checking from ABAP reports. Now as next logical step let’s talk about an activation of the ABAP report programmatically from the ABAP. Usually every dictionary object has to be activated before it can be used. The ABAP reports are not an exception. By activation process a source code of the ABAP report is being checked for syntax errors and afterwards active version of the report is generated. As last step of the activation process a load version is generated. There is also a process of the ABAP report generation. Unlike activation process this one only generates a new load version of the program. So no activation part takes place. Below I’m providing to simple program for the ABAP report activation. READ REPORT p_prgsrc INTO lt_source. INSERT REPORT p_prgtgt FROM lt_source PROGRAM TYPE '1' UNICODE ENABLING 'X'. Dynamic generation of ABAP reports is very useful feature. While generating ABAP reports on the fly from other ABAP report it is very useful to get syntax of the generated ABAP checked before it will run. Having the syntax check in place can prevent to undesirable dumps. In this blog post I’m not going to deal with many ABAP tools that are available in the system (like tcode SAMT – ABAP program set processing, tcode SCI - Code Inspector, tcode UCCHECK – Check for syntax errors in Unicode environment, etc.). These tools are very useful when performing of mass check for many programs is needed, like during upgrade projects. Here I’m just looking for a ways how to perform syntax check of one ABAP report from other one. In order to explore this I created two test programs that leverage different approaches of ABAP code syntax checks. * ver 1 via statement "SYNTAX-CHECK FOR"
READ REPORT p_prg INTO lt_source. SELECT SINGLE * FROM trdir INTO ls_dir WHERE name = sy-repid. As an example of second method you can take a look into SAP BW program RSAN_WB_VERI on how this is used in more sophisticated way. What was (is) SAP Box and what is SAP Mobile Documents? Few years back I wrote a blog post about platform used by SAP to manage document management. That time it was called as SAPMats. In 2012 the SAPMats was replaced SAP Box. The SAP Box was in use first by SAP sales team and later deployed to larger amount of employees. Initially it was leveraging SAP Afaria technology which is a mobile device management software product. It is used to connect mobile devices (smartphones/tablets) to computers to the company network. The Afaria was originally independed company which got under SAP’s wings after many acquisitions which ended while SAP acquired Sybase. After some years of usage the SAP Box was decommissioned and its successor is SAP Mobile Documents (mDocs). The mDocs is basically a solution for files sharing regardless of what OS platformand device user is using. It is designed for users who need to collaborate between each other’s. A security and control of business content are taken in consideration in this solution at very large extend. Users are enabled to access from anywhere and anytime any documents that they need on any device. As just brief overview here are supported platform which user can access the documents from: Microsoft Windows, Apple Mac OS, Apple iPad and Apple iPhone, Android powered device, HTML5-enabled browsers, Windows Phone and tablet. SAP Mobile Documents is available as on premise and also as SaaS solution in the SAP HANA Cloud Platform. The product is currently available in its version 1.0 SP05. PS: as this is my very first post in this New Year, I wish all my readers successful and wonderful New Year of 2016!